- Go to the 'Setup' page. 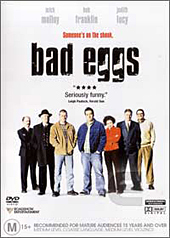 - Move left from 'Main' to highlight the 'Bad Eggs' title. - Press your Enter button for a Pete's page, where you can view his 'classic' scene as 'man on street' from Crackerjack, as well as the trailer for that particular little film. - Move left from 'Main' to highlight the 'Bad Eggs' title on the hidden Pete Smith page. - An option to view a rather poignant unused clip from the criminally short-lived "Micallef Tonight" will pop its head up. - Move left from 'Main' to highlight the 'Bad Eggs' title on the hidden Shaun Micallef page. - Bill's f*ckin' page will present itself. - Move left from 'Main' to highlight the 'Bad Eggs' title on the hidden Bill Hunter page. - Hang around a while and a 43 second wardrobe test will play. Go to the 'Soundtrack Promo' page in "Extras". - Press your Enter button for a 3:28 collection of interview snippets featuring Tony Martin, Judith Lucy and/or Bob Franklin plugging the arse out of Bad Eggs on shows such as "The Panel", "Rove Live", "Good Morning Australia" and "Micallef Tonight" (R.I.P.). - Go to the 'Trailers' page in "Extras". - Press your Enter button for a 1:34 Bob Franklin wardrobe test, complete with commentary from the man himself.